The camera has been found. Which is good, because I've been stressing over it. After I do this update, it's back to crazy cleaning mode so that everything is just so for her visit. 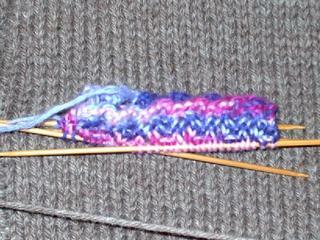 That would be the first few rows of my Socktober sock - Holly's Socks. It's an easy lacy rib pattern, but it was made up with sock garden in mind, so I'm hoping they will turn out all pretty. 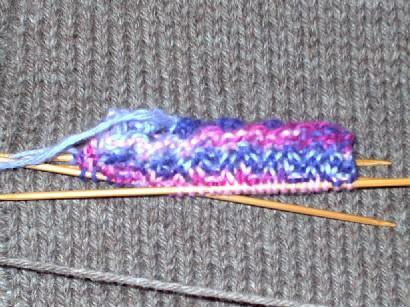 I'm using knitpicks sock garden in hydrangea, which was a gifty from my knitty sp4. The pattern recommended 2.5 mm needles (size 1.5?) but I got gauge on my size 1's which are 2.25 mm, so that's what I'm using. Do you see the lovely walnut heather background for my sock start? That's my gorgeous rogue. 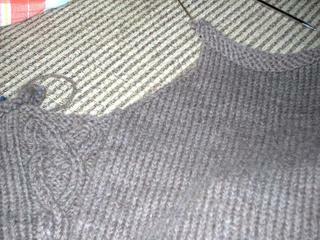 The picture below shows the top of the left cable panel and the armpit shaping that I've got going. Just what you wanted to see, huh? Armpits. I've got about 90% of the back done. 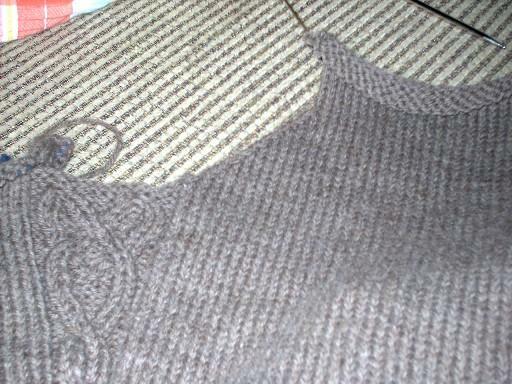 A few straight rows and then the neck shaping to go. And as much as I would love to go blog jumping and lavish love and commments on all you knitting bloggers, I've got to go. There are yellow rubber gloves waiting for me in the kitchen.